The BU Postgraduate Annual Conference, Wednesday 8 March 2017 showcases the best of BU’s postgraduate research. It provides a unique opportunity for Postgraduate researchers and Masters’ students to present their work. 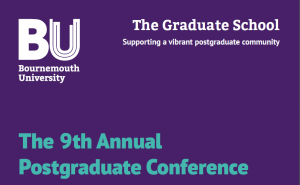 Abstracts are invited for oral, poster and photography presentations from Postgraduate Research and Taught students at any stage of their degree. Please download and complete the Abstract Form with reference to the guidance notes for Oral, Poster and Photography presentations. Visit www.bournemouth.ac.uk/pg-conference for further information. Please note, the number of oral presentations is limited and therefore the selection process is competitive – abstracts will be shortlisted by a Faculty academic panel and you will be advised if your abstract has been successful 2 weeks after the deadline date. I am Tiantian Zhang, the new Head of the Graduate School, I started on 16 Jan and have enjoyed the first two weeks at BU! Just tell you a little bit about myself – I graduated from Liaoning University with a BSc in Environmental Biology and worked as a research scientist in the areas of Environmental Science for 5 years in China before obtaining a MPhil degree in Environmental Biology at Middlesex University and a PhD degree in Cryobiology at University of Bedfordshire. I worked as a post-doc and a senior research fellow before I was made Reader in 2003 and Professor in 2005. I was the Director of LIRANS Institute of Research in the Applied Natural Sciences at University of Bedfordshire before joining BU. My work at University of Bedfordshire also involved working closely with the Research Graduate School on developing frameworks for doctoral training and Personal Development Planning programs and other cross institutional initiatives. My research interests are in the areas of cryopreservation of gametes and reproductive cells and its applications in biomedicine, conservation and animal reproduction. The work has mainly been focused on cryopreservation of reproductive cells and embryos of aquatic species, effect of cryopreservation on genome and metabolic activities of reproductive cells and fish stem cell culture development and cryopreservation. My research also included ecotoxicology studies using fish cell lines and other biological materials. My cryobiology research was funded by funding bodies such as the Wellcome Trust and the European Commission. The outcome of my research has led to 129 publications and 86 conference presentation. I have supervised 15 research students to completion and is currently the Director of Studies of 6 PhD students. I have enjoyed meeting many people during my first two weeks at BU and is looking forward to meeting as many of you as possible in the near future! I am also looking forward to working with you all in taking the Graduate School forward. The Graduate School PGR Development Scheme is open to all BU postgraduate researchers (PGRs) irrespective of mode of study (full-time / part-time) or funding status (BU studentships / externally funded / self funded). 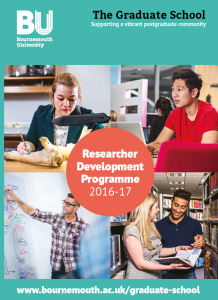 Individual awards will provide financial support of normally up to £2,000 (and exceptionally £5,000) for research activities related to an individual PGR’s research project or personal development. It is envisaged that each year approximately 15 awards will be made. Awards will only cover direct costs including travel; subsistence; training or development costs) and all applications will need to include a precise breakdown of costs. Applications should be supported by the Supervisory Team and the relevant Deputy Dean (Research & Enterprise) of the relevant AcademicSchool. Applications to the Scheme will be reviewed independently and all decisions on funding will be made by the Graduate School. For further information please read the GS PGR Development Scheme – Policy. Following the announcement by the Vice Chancellor in August 2011 that CRE would move from Finance & Commercial Services I am delighted today to formally launch the Research & Knowledge Exchange Office (R&KEO) with the remit of supporting all research and knowledge exchange (formally enterprise) activity at BU. Under the new arrangements our existing research and knowledge exchange units will report directly to me forming a collection of discrete, but cognate elements. Administrative support for the new R&KEO will be based in the Research Development Unit working in support of all the different teams. An overview of the status of each team is provided below. Research Development Unit – This will continue to be led by Julie Northam and has been expanded to also include knowledge exchange development. Two new posts will be advertised later this month: a research development officer to focus specifically on research ethics, governance and conduct, and a commercialisation and KTP officer. RKE Operations – Previously CRE Operations, this will continue to be led by Julia Taylor. We are currently reviewing the R&KE processes and systems, with a view to improving the already excellent service delivered by this team over the next 3-6 months. Business Engagement Unit – This is a new unit to be established as part of the HEIF-5 strategy. We will soon advertise for a Business Engagement Leader, followed by four Business Engagement Consultants each related to the investment themes set out in the HEIF-5 Strategy. It is hoped this team will be established from January 2012 and will work closely with the BU Foundation in developing BU as Knowledge Broker. Graduate School – Professor Tiantian Zhang joins BU as the Head of the Graduate School in January 2012 when we will formally re-launch the Graduate School. Until then Fiona Knight, and the School PGR administrators are keeping everything running smoothly. DM Centre for Entrepreneurship – The CfE is led by Professor Dean Patton and has recently moved into the Business Engagement Centreof the 6th floor of the EBC and currently in the process of seeking potential tenants initially around the two specific themes as set out in the HEIF-5 Strategy, namely: (1) digital and creative; and (2) tourism & leisure. I will ensure future developments with the R&KEO are announced regularly via the BU Research Blog. We are delighted to announce that up to 20 match-funded studentships are available for October 2011, or January 2012 starts. These will be allocated to project teams on the basis of a competitive process across the whole of BU led by Professor Matthew Bennett (PVC Research, Enterprise & Internationalisation) and the Graduate School. Only the best projects will be funded and proceed to advert as set out in the criteria below. Preference will be given to those projects demonstrating match-funding, however exceptionally innovative or timely projects on a non-applied theme will be considered for full funding. Applications should be submitted to Fiona Knight (Graduate School Manager) no later than the 13 June 2011. Staff are asked to check the eligibility criteria carefully before applying. Good luck! Matched-funding (50%; £21k over three years) may come from: industry/business partners, government and non-government organisations, Academic Schools, NHS, Research Councils or other external bodies. In seeking match-funding and developing the associated projects applicants are encouraged to avoid a local or regional focus. Exceptionally 100% funding may be granted for highly original, timely and non-applied or “blue-sky” research projects especially where they are strategic importance to a research group/centre. All projects should be linked to a REF Unit of Assessment and map on to its strategic goals. They must be endorsed by the applicants Line Manager and Head of Academic Group or Deputy Dean (Research & Enterprise). All projects should be innovative, novel and applicants are encouraged to appeal to the imagination of the assessment panel. The first supervisor should take responsibility for the applications and ensure that they meet the eligibility criteria set out below. Studentships are offered on a stipend basis for 36 months only, with fees waived for the same period. Fees will be charged after 36 months. Schools (or match funder) are responsible for providing each studentship with a guaranteed grant of between £3k and £5k over 36 months for use by the student to support fieldwork, consumables and conference travel. Normal studentship terms and conditions will apply. Applications will be assessed and awards made by a panel chaired by: Vice Chancellor – Professor John Vinney and consisting of: Deputy Vice Chancellor – Professor Tim McIntyre-Bhatty, Pro-Vice Chancellor – Professor Matthew Bennett, and three Senior Grade 2 Professors. None of the panel members are eligible to apply for support. Feedback on all applications will be provided to encourage proposal development. Once awarded all Studentships will be advertised and subject to a recruitment process managed by the Graduate School. Note that these funds cannot be used to support BU staff to complete doctoral programmes. The first supervisor should be the person completing the application and must be a permanent member of academic BU staff. The first supervisor should be an experienced supervisor defined as having successfully supervised an entire cycle of a research degree or successfully completed the full PG CERT Research Degree Supervision. The first supervisor should be research active, and be in consideration for the REF submission. 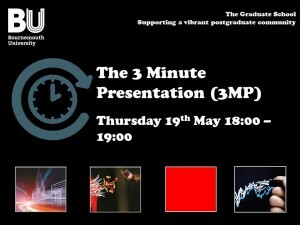 The applicant should be supervising no more than 6 PGR students including this project. All proposals should have a balanced supervisory team. It is envisaged that projects will commence either in October 2011 or January 2012. The call for proposals will go live on the 16 May 2011 via the BU Research Blog. In late May 2011, a generic “teaser” advertisement campaign (e.g., banner in THES or Guardian) will run announcing forthcoming studentships at BU encouraging potential applicants to watch the website. The call for proposals will close 11.30 AM on the 13 June 2011. Submission to the Graduate School Manager who will circulate to the judging panel for consideration. The panel will score each proposal and meet formally to select the successful projects. Successful applicants will be informed on the 27 June 2011. Unsuccessful applicants will be provided with formative feedback in the following two weeks. Full marketing campaign to be launched on the 27 June and projects advertised externally. Closing date for all student applications will be 31 July 2011 using the standard application form and submitted to the Graduate School. The Graduate School will manage the recruitment process. Interview days for all October project starts will take place in August. If an October start is proposed the first supervisor must ensure their availability during August to conduct the interviews. All interview panels will be consist of a member of the selection panel, first supervisor and a Professor from the host School and will be arranged and managed by the Graduate School. UEG approval of candidates is required and formal offer letters will be issued by the Graduate School. Interview days for all January project starts will take place in September. All interview panels will be consist of a member of the selection panel, first supervisor and a Professor from the host School and will be arranged and managed by the Graduate School. UEG approval of candidates is required and formal offer letters will be issued by the Graduate School. Proposal forms can be downloaded from here or email the Graduate School Manager. This blog is a reflection of the BU Graduate School story so far as the first incarnation of the Graduate School makes way for a new vision. When I was asked to set up the Graduate School in November 2002 as 0.2FTE of my time, it was in the wake of two RAEs where BU had been criticised for its lack of institutional support of its PGRs and a stream of complaints from our postgraduate researchers via the Student Union. The first step was to examine the processes and systems in place across both campuses which quickly revealed that the seven Schools had seven different sets of processes and systems and, even more challenging, it transpired that we had somewhere between 80 and 147 PhD students but nobody quite knew how many. When looking at the qualification rates at that time BU was only managing to get 11% of its PGRs through within 4 years and some researchers had been registered for more than 13 years! Eight years on the Graduate School has implemented a Code of Practice and a set of processes that are now common across BU’s six Schools, overseen the introduction of new and innovative doctoral programmes and help improve our qualification rates. The systems that the Graduate School has put in place were deemed to be so effective that members of the panel that came to BU for the institutional audit contacted the VC to ask if they could adopt the BU model for their own institution. BU was also one of the first handful of universities to introduce a credit bearing training programme for its supervisors, something that is now becoming commonplace across the sector. The support provided by the Graduate School to our PGR students has reduced the isolation and the complaints received from PGRs but there is still a long way to go to ensure that we have the correct systems in place to create a best practice research environment. The introduction of myBUILD as an online research student log and compliance system met with considerable resistance but was innovative at that time and BU was one of the first institutes across the HEI sector to introduce an online log. The lack of resources has meant that it was not possible to continue to develop the platform as the numbers of researchers increased but even though myBUILD has probably long gone past its “best before” date, it is vastly superior to the varied and somewhat unusual mixture of record keeping that was found in the individual Schools. There is an urgent need to redevelop the online system to make it more intuitive and better integrated with the other platforms across BU. BU now has well over 300 PhD students and the qualification rates, particularly those of our part-time researchers, is vastly superior to that of 2002. The Graduate School introduced the Annual PGR Conference which has been enormously successful and was an integral part of the Special Audit of PGR programmes, a working member of the EUA’s programme on improving the quality of doctoral programmes across Europe and was the hub for BU’s application to ESRC and AHRC for doctoral support bids (the former falling foul of the spending cuts but the latter achieving success). It is hoped that Graduate School will move from strength to strength as the importance of the postgraduate segment of our student body becomes more significant as we move forward in the 21st century.